Picture taken 20th May, 2001. This, according to David Streeter, in the book The Wild Flowers of the British Isles is a native of the Pyrenees, Alps and the western Balkan mountains. It is introduced into the British Isles but does not compete too well with our our native cow parsley except in the north of the country. There is line through Montgomeryshire and Staffordshire, north of which it out-competes cow parsley. The specimen photographed resides in our garden in Burwell and it was initially grown from seed gathered near Egglestone in Teesdale. We grow it in our garden and it has no problem growing or seeding. It is a very robust plant which, once established, can be very difficult to dislodge as it has a large tap-root. It seeds itself freely, but the young seedlings are easy to weed out. We do not understand why this plant is not a lot more popular: gardening programs make much of cow-parsley, yet sweet cicely is not only a prettier plant but also has a longer growing season and is edible! All part of the plant are edible - though the older leaves and stems are too tough to be eatable and the old roots are also very woody and consequently unpalatable. We don't have a sufficiently abundant supply to experiment with eating the roots! We use the young leaves and especially the young stalks as a staple for salads, especially in spring. The best bits are the young stalks and leaves before the leaves are properly open. The young flower stalks are just as palatable. A Cicely stick also proved to be an excellent pacifier to my youngest son when he was a baby: they plant has a flavour very similar to aniseed. To this day Michael is very fond of a fresh ciceley stick to chew on. 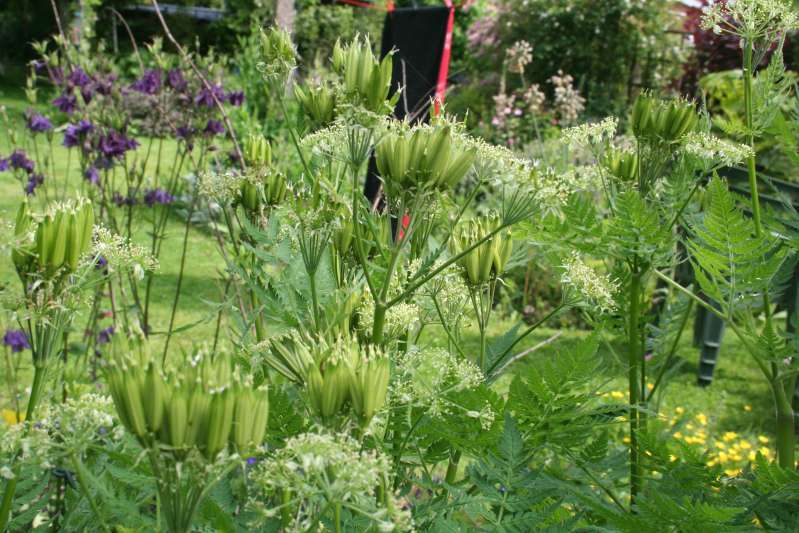 The young seeds (picture, left) whilst still green and fresh, are also excellent, having a strong aniseed taste. They may be eaten as they are, added to salads or used as a flavouring but they need to be picked soon after swelling as they quickly become stringy and unpalatable. The whole plant has the same aniseed flavour. The young leaves, in my opinion, are not quite as nice a texture to eat in salads as are the stalks, which are every bit as crunchy as celery, but the leaves, being much divided, do soak up dressing excellently! 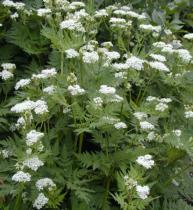 The plant itself is similar to several other umbellifers - for it is a member of the celery/carrot family. Closest to it in appearance is cow parsley, but cicely is altogether a prettier plant. It has a more dense habit, both in leaves and flowers. Cow parsley is edible, though rather tasteless, so that presents one way to distinguish them. The other plant you should not mistake it for (nor are likely to, once you have seen them both) is hemlock (conium maculatum). This deadly poisonous umbellifer is a much darker green than either cicely or cow parsley and has red spotted stems which are quite distinctive.